This design is free for DIY. Not for Commercial Use. This article may not be published in part or full without the express permission of AmpsLab. The Oriole is designed for users that want a compact, quality speaker that can be listened to all day at low volume. With an F3 of 50Hz, the Oriole goes fairly low. 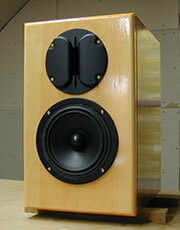 This midwoofer is small yet has quite a fair bit of bass output at resonance. While this is an advantage, it is insufficient on its own for our purpose at hand. More bass is needed as the Oriole is meant for low volume listening. Without some form of bass enhancement, it'll sound very "thin" (Equal Loudness by Fletcher and Munson). This imbalance, the lack of bass, is very tiring to listen to for any extended period of time. That's why vintage preamps have "Loudness Switch". To compensate for our inability to perceive bass at the same loudness as the mids when playing at low volume, I decided to boost the bass acoustically instead of electronically. This is accomplished by tuning the box for a higher Q instead of for flat. In the violet plot on the right, where the Oriole's port and the W5-704s outputs are combined as one, the effect of the Box higher Q is clearly visible. 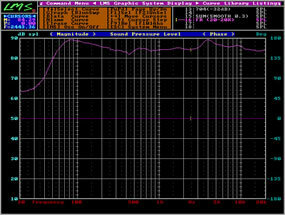 Upper Bass (80-100Hz) is boosted by about 2dB. This will make the bass slightly more audible. 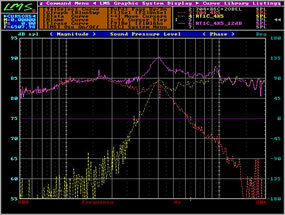 The only other contouring is a mild, 2dB Baffle Step Compensation to prevent the mids from being emphasized. 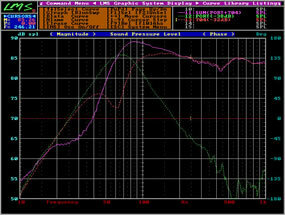 No other equalization is required as the midrange is smooth and clear of any peaks and valleys. 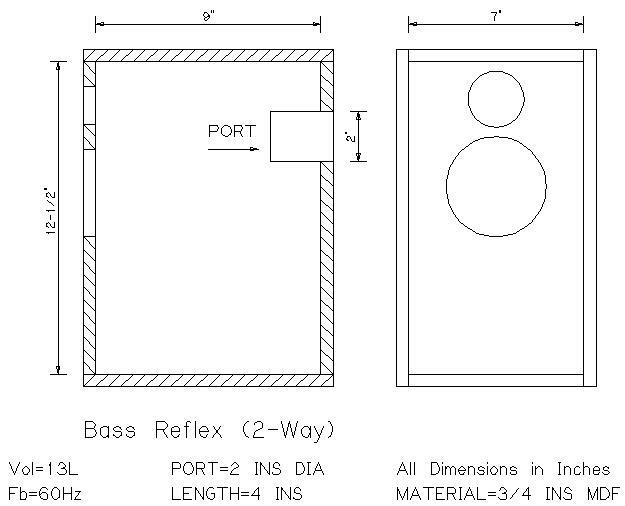 Having the right proportion of bass does not guarantee success. If the highs are not well integrated, the harshness that ensue will "turn-off" most listeners. After much soul searching, the eventual winner is the RT1C from HiVi. This tweeter is a budget exotic. Instead of a diaphragm made out of fabric or metal, the RT1C uses a piece of Kapton film with a pattern of aluminum conductors. The resultant effect resembles a ribbon tweeter, minus the fragility and cost. The low cost of the RT1C carries with it a penalty, a fairly high cross point. 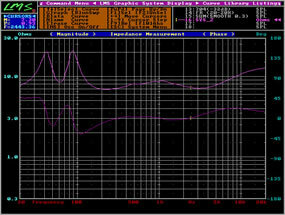 From my tests, 4,500Hz is about the lowest it can go without distorting. Fortunately, the W5-704 is able to extend up to this frequency. 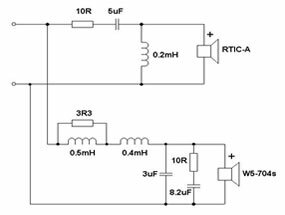 The RT1C does have a hidden advantage that atones for its high crossover frequency. It is in its thiness. From the front to the back, it measures a grand 17mm. Because of this slimness, the acoustic centers of the RT1C and W5-704 fall nicely for a symmetrical second order crossover to sum magnificently. No cancellation is observed on either side of the crossover frequency. A rare instance of textbook summing in the real world. 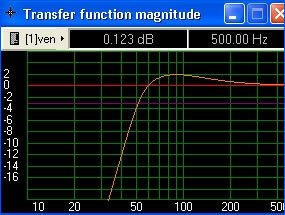 The 3dB gain at the crossover frquency is indicative of a Butterworth High and Low Pass network at 12dB/octave. It may appear excessive but no exaggerated sibilance was detected when subjected to a variety of music. The Oriole acquitted itself well when put to the test. From classical to jazz and rock, no listener fatigue was encountered after playing the entire day. Just soothing, relaxing background music. An excellent companion in combating stress in our daily lives. 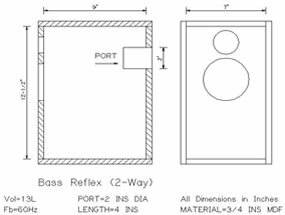 Enclosure Internal Dimensions (WHD) 7" x 12-1/2" x 9"